A friend of a friend contacted me recently wanting to know how to turn her life story into a book. Since I realized there might be other people with the same question, I decided to post my reply here. 1. 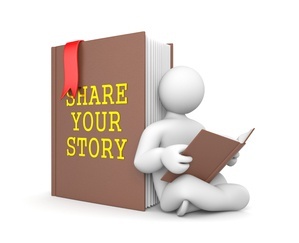 You write out your story so that you can give it to your family and friends, and pay a small amount for that. This is the simplest option, and doesn’t necessarily require excellent writing, although the better the writing, the more likely people are to read it. 2. You hire an experienced writer to write the book for you and then you publish it so you can sell it when you speak or on the internet, etc. The question is, do you just want your story told, or might you want to write other things, too? If you just want to have this one book written, you might be wiser to find what is termed a ghost-writer to write the book with you. In other words, you’d either do the first draft and have the writer/editor do the rest, or you’d tell your story to the writer and let him or her write it. No, I am not recommending having someone else write your book and then putting your name on it and not giving any credit to the other person. I loathe, detest and abhor that practice, which has been all-too-common in publishing circles for many years. See my post on ghost-writing here. Note: Occasionally you might find a writer who believes in you or your book and is willing to help you for a share of the profits, but this usually comes out of a prior relationship. 3. You learn the skills of writing and then you publish the book so you can sell it when you speak, on the internet, etc. Most newer writers don’t realize that the key to good writing isn’t the story itself, but how you tell the story. You might also want to peruse my videos and subscribe to my newsletter since I’ll be posting more advice here in coming weeks. Your local library might even carry some of their books. I’d also strongly advise you to start by writing at least a few articles instead of a book. It’s much easier to write a short piece, and the skills learned will definitely help you with the book. As for self-publishing, there are many options, and we’ll be mentioning more about publishing here. Just beware, because they are dozens of self-publishing companies out there who are not particularly reputable and could take a lot of your money and not deliver a quality product. Check every company out on Writer Beware or Preditors and Editors or Reedsy’s Scams and Companies to Avoid. 4. You learn the skills of writing and find a publisher who will publish your book for you (and pay you royalties). This is getting harder and harder to do. Not impossible, but very difficult. Your writing needs to be very good and you need to show them that you can sell books. If you are interested in writing the book yourself, I’d strongly urge you to join at least one writers’ organization. You’ll meet writers and editors from a wide range of experience and expertise, and you can learn a lot from other writers.